Mounted on V-Tec 326 Off-Road Wheels, the LT285/70/17E Cooper Discoverer AT3 tires fill the wheel wells of the Chevy Silverado really well. More aggressive than the older Cooper Discoverer ATS, the AT3's seem to be the perfect blend of a highway friendly off road tire that is very capable off-road and guiet to drive on road as well. Heavy deep lugs combined with a stiff sidewall make these tires a truly capable off-roader yet is still both quiet in the cab and sure footed when on the pavement. With 3200 miles behind us over some of the most grueling roads in North America the Cooper Discoverer AT3 have proven to be an excellent tire. Broken pavement, sharp gravel, both wet and dry pavement and plenty of slimy clay; all of these conditions were encountered and presented an excellent test ground during the 3200 mile drive to Alaska. Not once did the Coopers disappoint us as the ride was smooth, especially for a 10 ply tire, quiet and sure footed. 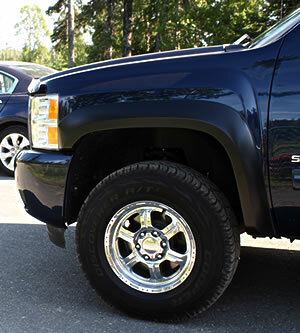 Loaded heavy, the 2011 Silverado glided effortlessly over the bumps and potholes along the early summer northern roads. Crisscrossing the mountains and tundra was absolutely no problem on both the wet and dry roads we encountered along the way. When the pavement would end, the Coopers just grabbed hold and the Chevy tracked straight and true. Occasionally we would take a detour over a secluded side road that required more out of both the tires and truck. Both made the journey seem effortless and after each that we would encounter, our hesitancies would become less and less. These are very capable tires and a great choice for others looking at open roads and back country rock or gravel as the main surfaces expected to be stumbled upon. NOTE: The tread compound of the Cooper Discoverer AT3 is formulated with a chemically-coupled silica and carbon black mixture said to improve wet traction and reduced rolling resistance thus increasing fuel economy. 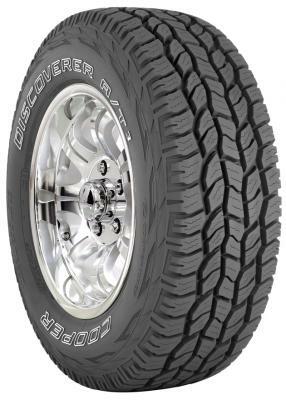 Summing up our initial review; our experience with the larger and heaver LT285-70R17E Cooper Discoverer AT3 tires proved that excellent handling and traction are possible with these All American Made Tires from Cooper.